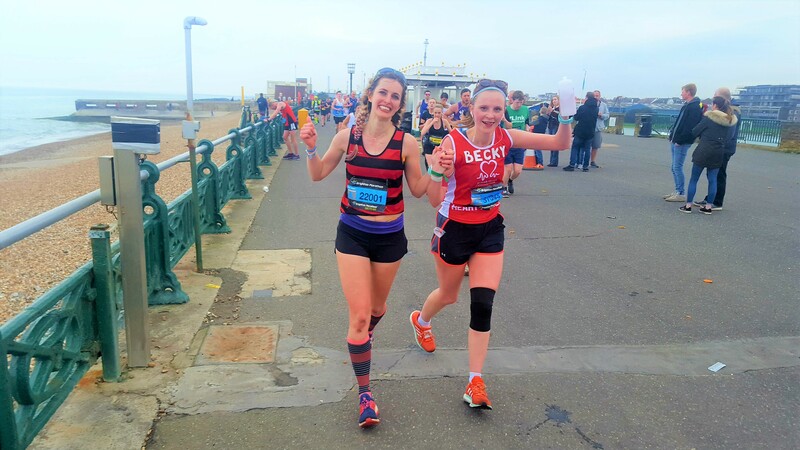 So……..I just finished my first marathon, in Brighton!! I finished and did not hate it, so that in itself is a massive win and I am super proud of myself. Still can’t quite believe that I ran 42.2 km! I’ve done a lot of races, mostly half marathons, 10ks and 5ks, but never a marathon and never have I appreciated the atmosphere as much! 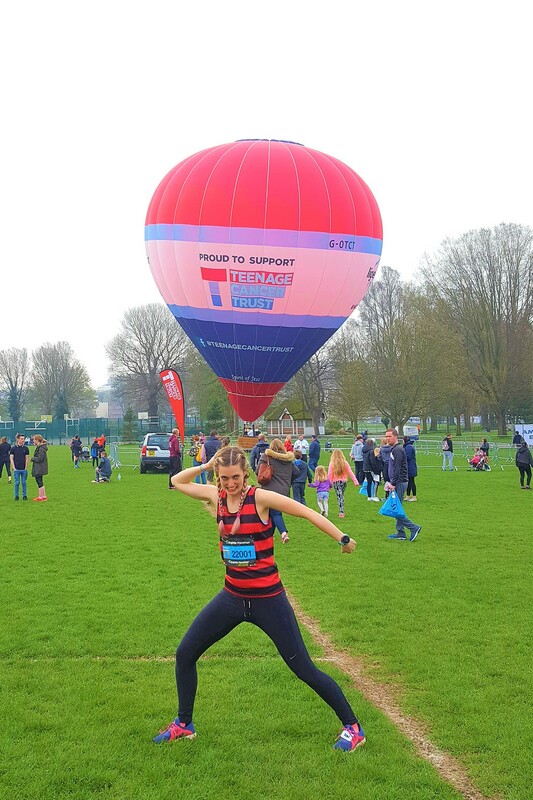 I had a great run up to the event in training and even got a massive half marathon pb in my tune up race, so I was feeling cautiously optimistic… but that didn’t meant that I wasn’t nervous. After a well-rehearsed breakfast, the lovely B&B owner drove Simon and me up to Burgess Hill train station in plenty of time to get pretty much the ONLY train that would get us there for a suitable time. 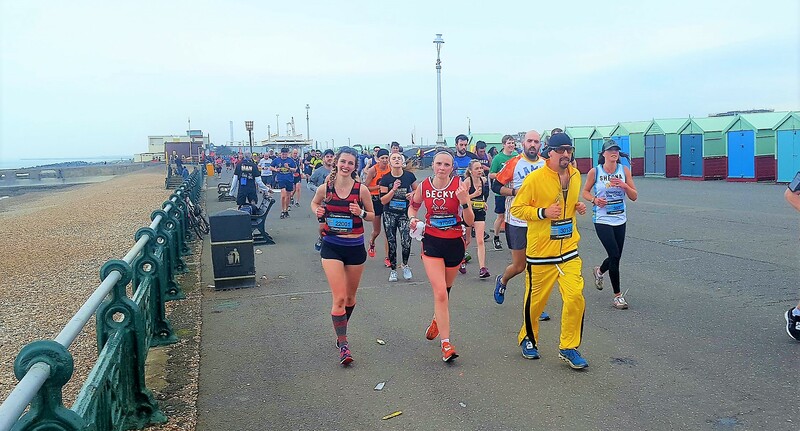 You could tell there was a running event on because the only people at the station were either wearing bright colours and lycra or were with someone who was. Problem being one of the last stops before Brighton was that the train was already pretty much full and we ended up running to the end of the train to squeeze on where we could for a commuter style sardine journey in to central Brighton! Unfortunately no one else was allowed in with me so I didn’t really take advantage of the rest of the stuff because I didn’t want to be on my own in there just worrying myself. I was so worried in fact that moments before going into the corral I managed to get myself worked up enough to cry on Simon…the things he has to deal with! 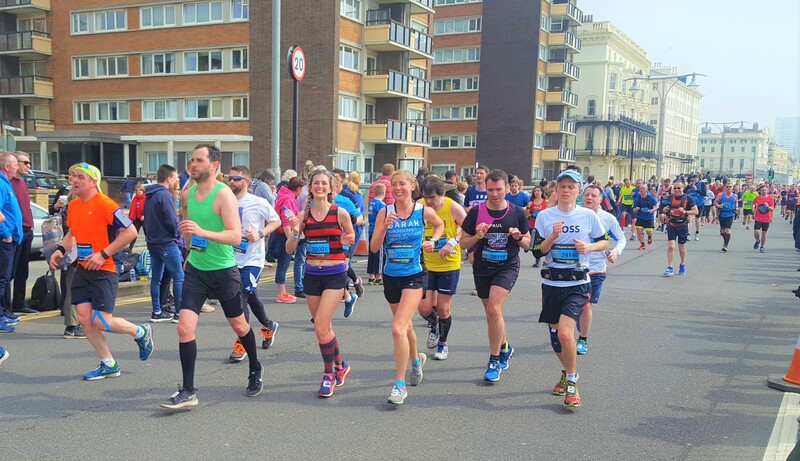 😀 Not entirely sure why I cried but I was feeling rather overwhelmed by the atmosphere and the thought that I would be running for c. 4 hours! Once in the corral the tears turned to determination and excitement once again, I was ready to go! Prior to the race my friend (and training partner), Becky, and I had decided on different race plans, so I was starting with her but we’d be going off at different paces. I gave her a hug good luck before setting off and then tried to set off at a sensible pace. 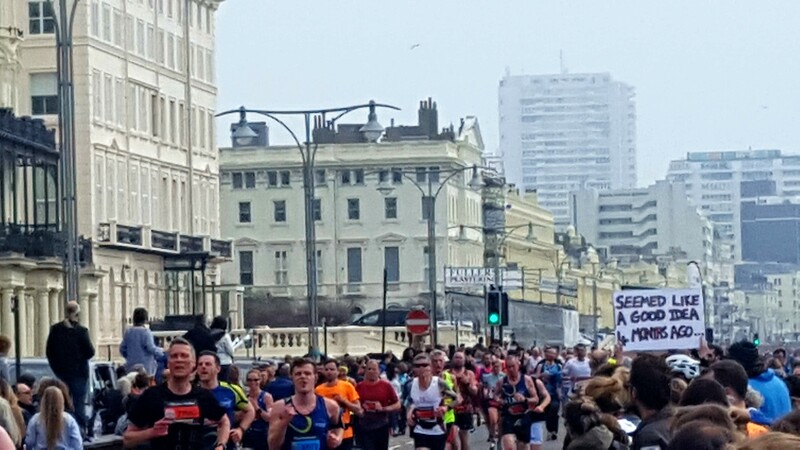 The turnout of spectators was amazing, having never experienced it to quite this level before I almost cried in the first 5km. I was desperately trying to slow myself down so as not to go out too fast such was the effect of the atmosphere, this was helped and hindered with going up and back down the biggest hill of the course in the first and second kms, around Preston Park before heading into central Brighton. There were some supporters who I had not expected to see and it was sooo lovely to hear my name called out and see the happy faces cheering me on, but none so much as when I spotted Simon opposite the Banksy artwork close to the Brighton Pavilion. 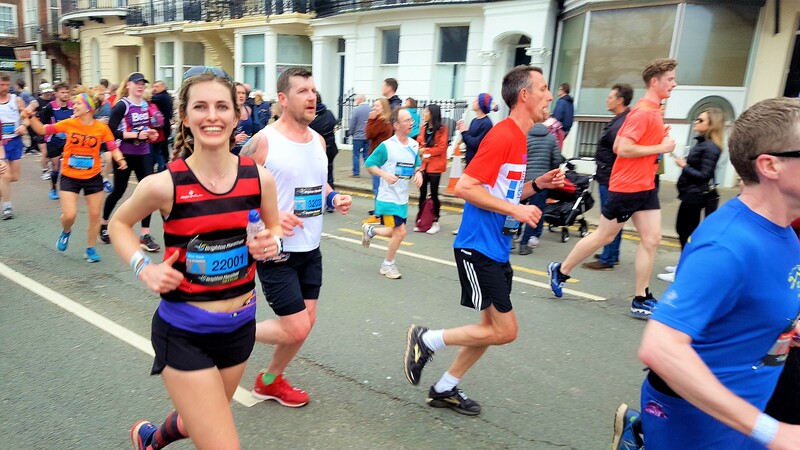 In race situations it’s usually the other way around, me running around the course trying to get to as many places as possible to cheer him on, so it was lovely to experience it from the other perspective. I had great fun playing spot the Herne Hill club mates around the course (both other runners as the course loops back on itself several times, and spectators)…the great thing about the Herne Hill club kit is that it’s very easy to spot, good for both me looking for others and people to spot me (I’m rather average height/looking for a female so not easy to spot, despite my attempt at go faster hair). 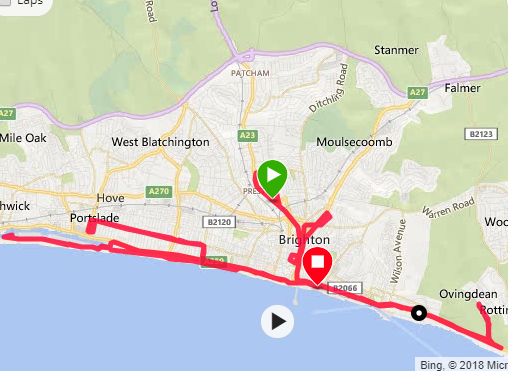 I managed to run the first 25km pretty well with a fairly even pace despite the hills, Brighton is not as flat as the profile led me to believe, the course profile in feet and miles made it hard for me to understand being a metric girl) but I tried to run the hills by feel not pace! Along the way to Rottingdean the leaders came the opposite direction from which me and those around me tried to remember to take inspiration from later. I also then managed to see the fast club mates and cheer them on with a few loud squeals! The section out to Rottingdean is one of the quieter sections for spectators so it was nice to chat to some of the people around me a little as well as spot the weird and wonderful fancy dress and fundraising ideas that people were running in: a telephone for the samaritans, post box, Ali G, a wedding dress, tutus, pink beards, pushing wheelchairs, one group of about 10 running as a boat. I had lovely company for the 10-25km from a lady named Sarah as we got chatting about the hills and then other stuff! She had her name printed on her Parkinson’s charity vest so she got a lot of people calling out for her…I wasn’t quite sure if I’d like that or if it would annoy me. I really loved knowing exactly when people I knew were cheering me on although the crowd support was awesome too. The east-west section from kms 19-25 was jam packed with spectators and the noise was phenomenal. 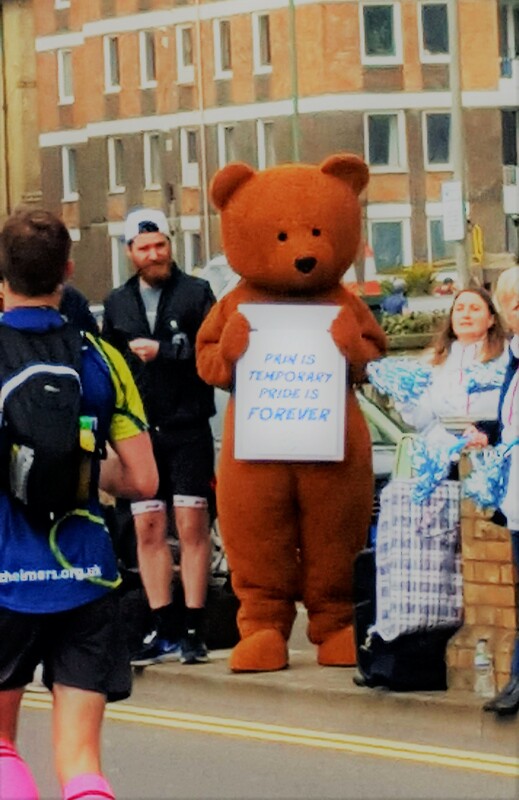 It made me well up again and then when I spotted Simon again it gave me a massive grin on my face as well as the huge cheer my friend Ruth gave (who was there spectating for her husband) as I went past. Pippa and a new running friend! Sarah and I were running at the perfect pace for each other until 25km when my mind just said nope, need to slow down, so I let her go. This was the point when I knew there were none of the supporters for me and it’s an out and back section through residential areas (Hove? ), so think it was a mental issue for motivation but I knew Simon would be waiting for me at 29/30km so I just told myself to get to him and tried to think about all my running friends (thank you Taryn, Zoe, Helen, Ruth, Isa, Jenny, Karen, Anke) who wished me luck beforehand with their smiley happy faces in my mind and to think happy thoughts. There were still loads of supporters at this stage – lots of families with the children giving out sweets and fruit so that was lovely to see. Simon was waiting for me at 29/30 km where it was pretty quiet for spectators which was the perfect time for him to be there! And thank goodness he was because my legs went into massive spasms and I had to stop and stretch them. 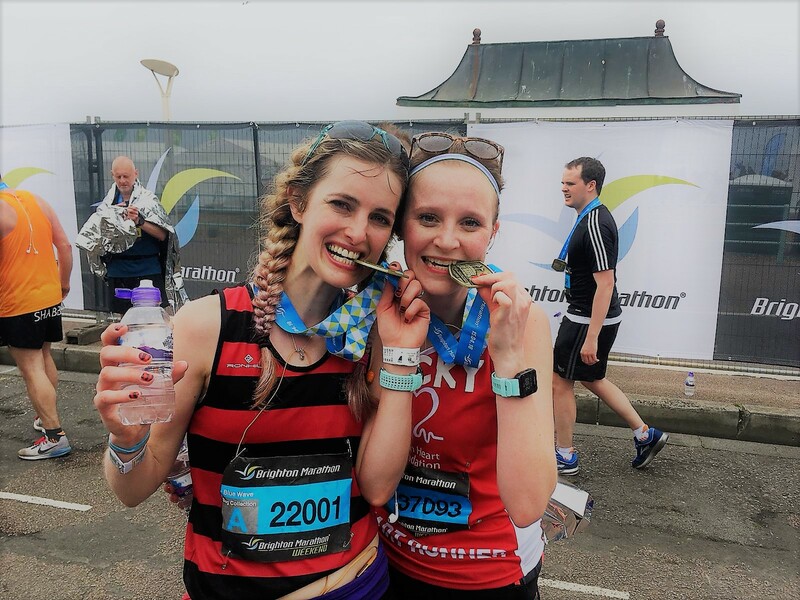 He jogged along the pavement near me cheering me on, spraying deep freeze onto my legs while jogging alongside, and supplying percy pigs and water as I got myself going only for them to spasm again on and off until 35km. The St. Johns Ambulance people were wonderful checking I was ok to which I replied, “I think so, just cramps!”. They had their work cut out as I saw a few men down in the recovery position or being wheeled off to the ambulances (very sad to see). 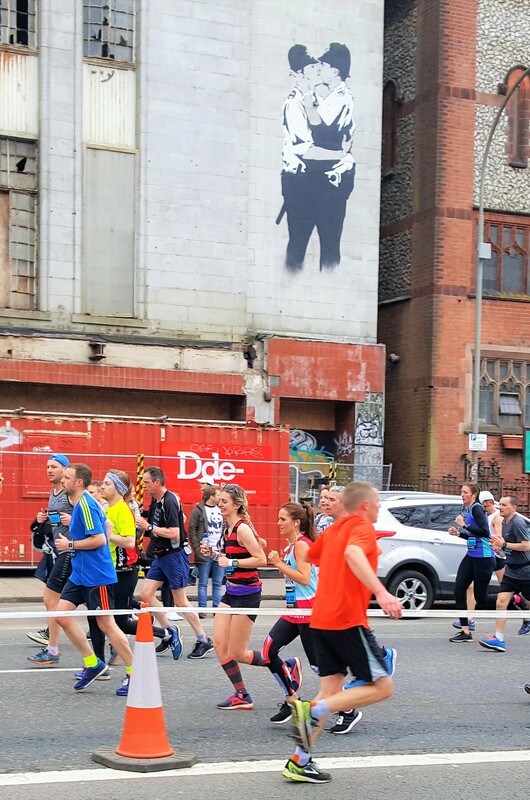 I also have to thank the vegan runners club who were supporting out near the power station as they gave me energy blocks with caffeine in which may well have helped to reduce the cramp. 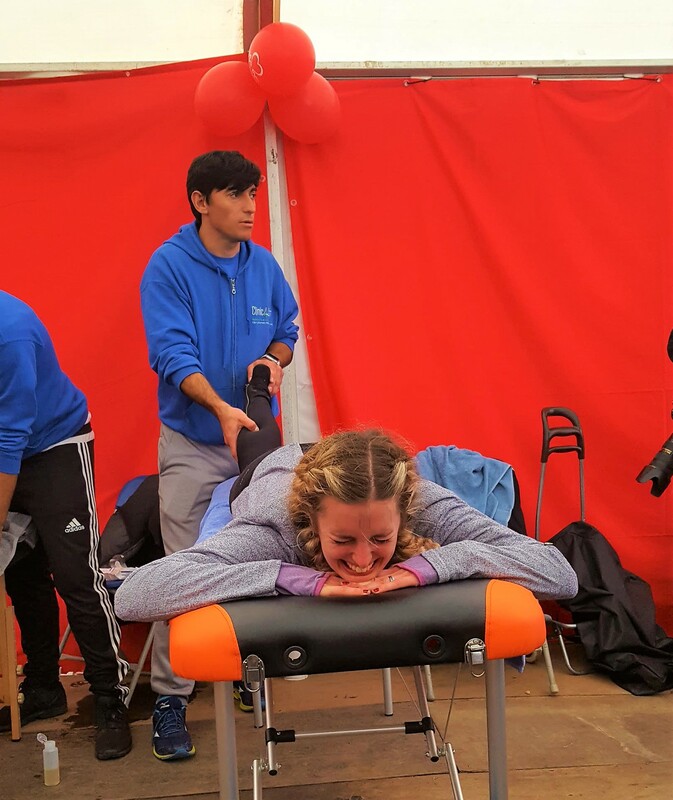 I am also so thankful to the people in the British Heart Foundation tent where they gave me tea and I got a massage which helped relieve some of the cramps. 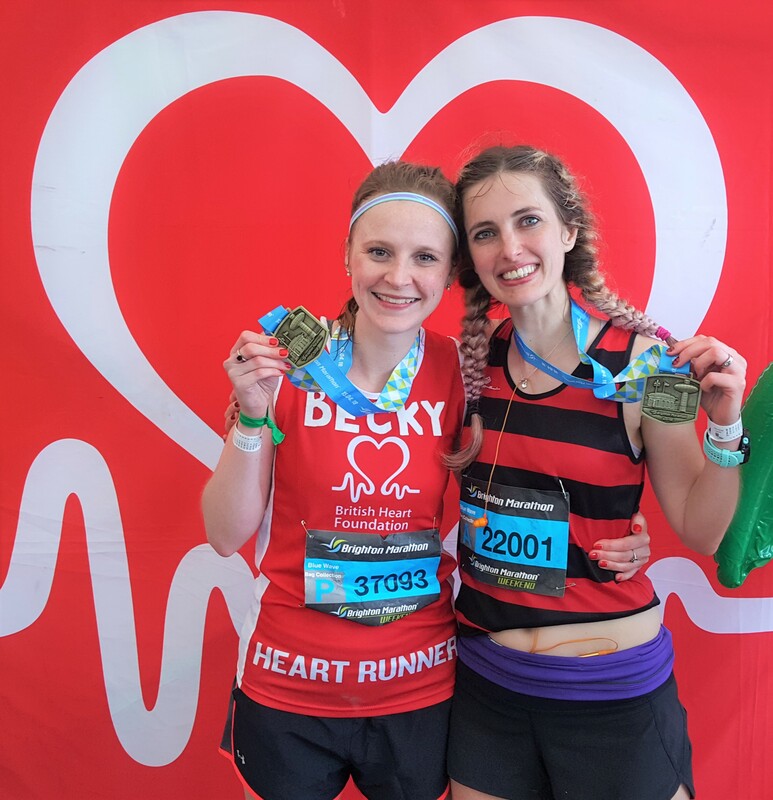 I also managed to bump into Sarah after the finish and I found out that she did amazingly well to finish in basically the same pace all the way, amazing achievement and I think I made a new running friend!